I'm way behind on my blogging, but with holidays out of the way, I can finally reveal the top secret project that I've been working on for the past couple of months. Well, when I say 'top secret', those who know me in person saw me working on it, but I've avoided blogging anything as the intended recipient reads this blog. 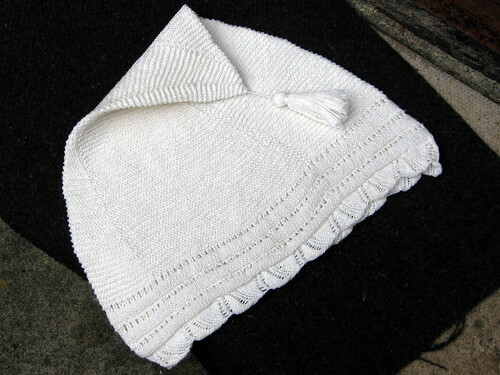 Last year, I spied this pattern on Knitty for a 1840's gentleman's nightcap. But there are those of us who do know potential Victorian gentlemen who might have a cold head, hence the reason we might want to knit it. This is Richard, who likes hats. Richard also has the LARP bug and is something of a re-enactor, which means he has a reason to collect hats of all sorts for costume purposes. I saw this pattern last autumn and immediately thought of him. Sadly, my Christmas knitting list was already very full with items for my numerous relatives and I didn't see me managing to make it in time for December, so I decided to try to make it for his birthday which was earlier this month. 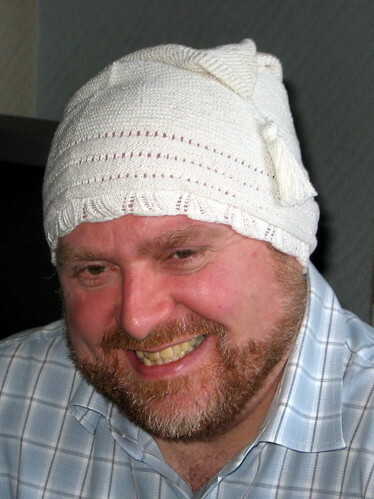 I queued the pattern on Ravelry and watched carefully as other knitters attempted to make it, with mixed success. The main problem seemed to be gauge, with quite a few people's efforts resulting in a hat of elephantine proportions. Franklin himself commented on the problems on his blog, reminding people that this was a lace weight project intended for tiny, tiny needles and that if you made it from a heavier yarn, you'd need to gauge up. This seemed sensible, but after thinking about it (and after all, I had plenty of time to knit it) I decided the thing to do was to find the right yarn, find the size needles it knit up well on and then re-gauge accordingly. i.e. work out the correct gauge for the yarn I wanted to use on the needles which suited it best. After much thought, I decided on a crochet cotton I'd seen Steelbreeze using for her Blusa Queen (yes, the pattern is in Portuguese - Steelbreeze is a brave lady), a sort of lacy cardigan she's been working away on. This cotton is very soft and wearable, not like many crochet cottons that I seem to see for sale which while shiny, are a bit scratchy. The cotton in question is a No. 10 called Clea 1000, from Circulo, bought from Yarnstick who is a small trader based in Birmingham. After a bit of playing around, I decided it knitted up in stocking stitch nicely on 2mm needles, to a gauge of - 38st x 60rows = 10cm. Next, I needed Richard's head measurement and despite sneakily trying to measure his hats at events, I wasn't doing very well. I discovered that Richard often buys hats because he likes them, rather than because they fit him very well. 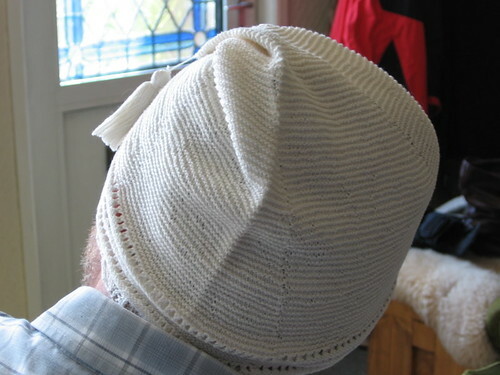 So, I guestimated that I'd need to size the brim at about 60cm, working on the basis that if I'd sized up, then a loose night cap was much better than a very tight one which would cut off the circulation to his head while he slept (yes, I kept its original function very much in mind). The lace border on this hat has a 13 stitch repeat, meaning I needed to cast on a multiple of 13 stitches to make it work. So I cast on 221 stitches on my 2mm needles, bought specially for the job, which gave me an expected brim circumference of approx 59cm. I started to knit, only to discover nine rows in that while I'd checked and double checked that there was no twist when I joined for circular knitting, somehow I'd managed to knit one in. I ripped the whole thing back and restarted... And did exactly the same thing again! The third time, I became paranoid, checking there was no twist at the end of each round. I was using a very long (150cm) 2mm needle, with the magic loop method and the only thing I could think of was, that I must somehow be pulling the needles up on the wrong side of the knitting. This time it worked and the brim knitted up fairly quickly... Then I entered some sort of weird temporal dimension where no matter how much I knit this hat, it never seemed to grow at all. I plodded on determined to finish this hat and after starting it on 14th April, I finally cast off on 12 June! There followed a hurried scramble to add a tassel (my first ever) and wash and dry the hat, finishing it mere hours before I handed it over to the birthday boy. I am happy with the result and think that all things considered it came out well, but I am relieved that it is finally done. And I do not want to make another one any time soon! The present was brilliant, and wisely keeping it off your blog meant it was a surprise, seeing the effort you put into your project makes it all the more appreciated, I just have to get over my fear of it getting damaged, its too nice wear. Hurrah, 'tis finished. Looks great.